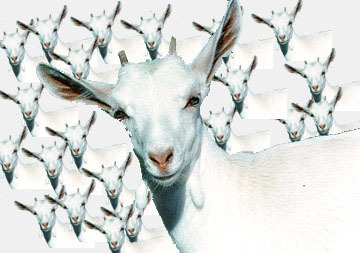 Goats, the currency of prika. Why did the tradition of paying a prika disappear in the DC area? Was it some feminist notion that women aren't property and that you can't put a price on love? Was it the realization that most Greek girls in the area probably should be the ones demanding money to marry the sometimes sub-par Greek men? Was it that goats were no longer allowed inside the Beltway? Who knows? But imagine if the system was still in place. How would that work? Is there was simple tabulation of how much of a prika should be paid in any given situation, like a tip card you would carry with you when going out to a restaurant? We've come up with a list of situations and the proper number of "goats" (our universal prika currency) that should be exchanged for any planned nuptials. Since it is the 21st century and there should be equality between men and women, our prika system can have goats going in either direction, either to the guy or the girl. The following is an example of the most common prika transactions that could happen in the Greek-American community. Greek guy plans to marry Greek girl over 15 years his junior. 10 goats to girl. He should consider himself a lucky man and gladly pay over his goats and demand nothing in return. Greek guy professional plans to marry Greek girl doctor 5 goats to guy. Goats should be used to compensate guy for inconvenience of being on-call during all major holidays and almost inevitable breaking of dinner plans on a monthly basis. Greek guy, manager of parents' restaurant, plans to marry Greek girl doctor. No goats. Dude, you're marrying a doctor. Just be thankful you'll have someone around who knows what to do when the gyro grease in your veins causes an aneurysm. Greek guy lawyer plans to marry Greek girl lawyer. Goats held in escrow until judge's decision. Doubtful these two will ever be able to reach a resolution on who gets the goats. Greek guy plans to marry Greek girl who hasn't missed a Greek night since she was 17 and doesn't intend to stop now, 12 years later. 10 goats to guy. Guy can hang out with the goats while wife is out hanging out with her friends, or eat the goats when her turn to make dinner falls on a Friday or Saturday night. Greek guy from either Virginia or Maryland plans to marry Greek girl from the opposite state, with insistence that she live in his state. 15 goats to girl. Making the girl live in a completely different state, go to a completely different church, and frequent a completely different set of stores and personal services establishments will demand many a goat. Greek guy from either Virginia or Maryland plans to marry Greek girl from opposite state, with insistence that he live in her state. 1 goat to guy. He probably doesn't go to church, never goes shopping and maybe has one friend in the other state that he'd see like once every couple of months anyway. One goat pays for the installation of big screen TV which should make him forget where he is. Greek guy from either Virginia or Maryland plans to marry Greek girl who insists that he live in DC. 12 goats to guy. Have you seen the cost of living in DC? And the taxes? Holy cow!, er.. goat! Greek girl plans to marry Greek guy who dated everyone on her GOYA basketball team. 15 goats to girl. Seriously, didn't the matching uniforms tip you off that they might all know each other? That's a 15 goat penalty just for being dumb. Greek guy or girl marries a non-Greek. The Greek should demand as many goats as possible. Tell the non-Greek that it's a cute Greek tradition, like breaking plates or dancing on tables, and if they really want to fit in with the Greek culture, they should willingly pay the prika and say "Opa" or something. Greek guy goes to Greece and finds Greek girl. 20 goats to guy. Explain to the girl that customs usually ends up taking a certain percentage of your goats, so it'll really only be like 14 goats when it's all said and done. Greek girl goes to Greece and finds Greek guy. 25 goats to girl. Honestly, if he's in a country with that many Greek girls and he still hasn't found anyone, there must be something wrong with him. Greek guy whose parents own a diner plans to marry Greek girl whose parents also own a diner. No goats. Does this marriage of stereotypes need to be more Greek?